We’re so pleased that Sara & Giuseppe Sinaguglia, founders of The Olive Tree Cookery School in Wareham, have allowed us to use their wonderful Porchetta recipe this Christmas. 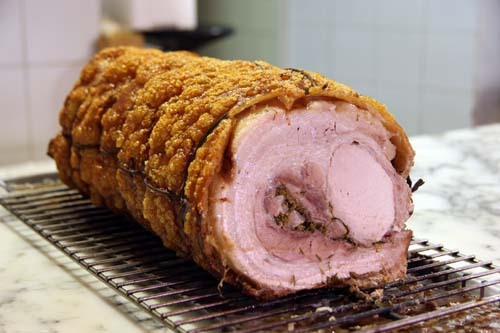 Porchetta is a recipe used for festive occasions in Italy, when entire extended families (in the Rome region) would raise a suckling pig in their backyard, before slaughtering it to feed everyone. Giuseppe has given the recipe a little Sicilian twist with lemon zest, dill and chilli. This special recipe also features the (optional) extra of caramelised figs for the ultimate festive treat. Preheat your oven to its highest setting. Put the scored loin of pork skin side down on a chopping board. Sprinkle the fennel seeds, chillies, fresh bay leaves and lemon zest over the meat. Season with salt and pepper. Roll the belly around the loin and tie it tightly with string to keep it all in place. Put in a roasting tray and drizzle a little olive oil over the skin. Season with salt and pepper, rubbing it into the scores. Place in the very hot preheated oven and after an hour turn the oven down to 180oC/350oF/gas mark 4. The high initial temperature will encourage the skin to lift and the crackling to start, while the lower constant temperature will allow the meat to cook evenly and stay moist. It will need a further 3 to 3.5 hours to cook, depending on size of joint. When the meat has been cooking for an hour, add the roughly chopped celery, carrots and onion to the tray with the broken-up bulb of garlic, whole rosemary sprigs and the wine. Give the tray a shake to get some fat on to the vegetables. When the meat is cooked, remove it from the tray and allow it to rest for 10 minutes. Use the vegetables and residue left in the tray for the gravy. Pour off the fat and add a little water or stock, then stir the gravy to loosen the residue on the bottom of the pan. Boil and season if necessary. To thicken the gravy add some roux (flour and vegetable oil) at this point. For the optional caramelised fig garnish: Wash and dry the figs then cut them in half. Place a frying pan on a medium heat, add a knob of butter and leave to melt. When the butter starts to turn brown place the figs in it flesh down and cook for a few minutes or until caramelised. Serve on the side of the plate with the carved pork.